How come we never talk enough about death? I attended yesterday a memorial service for Virginia Greene (1944-2010). I didn’t know her well. I had met her on the UBC Board of Governors that she joined about a year ago. She was already frail and suffering the effect of chemotherapy. But I do remember thinking: wow, what a classy woman. During one of these daylong and never ending Board meetings, Fellow Governor Barrie McCullough saw himself getting pampered like never before. He was on crutches after a hip operation, and Virginia who was sitting between us, made sure all day that he never runs out of coffee, water, fruit, and the works. She picked up his crutches for him from the floor whenever he needed them. The who’s who of the British Columbia establishment filled the elegant Christ Church Cathedral. Starting with the BC Premier, surrounded by the half-dozen contenders for his job, and including every business leader and media personality in town. A situation where you recognize a hundred faces (from TV screens to billboards, etc), but you can’t remember the corresponding names. I saw Arvind Gupta at the service. What are you doing here? “Well I knew Virginia very well. 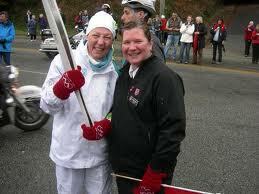 She helped MITACS big time when she led the Business Council of BC”. You get the idea. Virginia Greene was a mover and shaker in British Columbia and beyond. What’s most remarkable is the variety and the number of fronts she was working on: Politics, Business, Tourism, Philanthropy, Church. You name it. “Go big or go home” was her motto. From the speeches one could see what a force, a positive force Virginia Greene was to her community. “Watch out heaven”, one speaker exclaimed. But the most compelling story came from her priest. He had gone to see her in the hospital a few days before she passed away. “This is it, I guess”, she said but “how come we never talk enough about death?”, so as to be ready for this moment. It dawned on me then, how tough it must be for someone who has been in charge and in control all her life to accept her own demise, a situation where she has no say whatsoever. It must be awfully hard for doers, movers and shakers to face up to this imminent moment of a lifetime. One could see it clearly in Virginia Greene’s string of activities during her last few months. She declared ovarian cancer as public enemy number one and started strategizing and planning for its defeat. She had choreographed every minute of her own memorial service. It was magnificent. This reminds me that the UBC Board has recently approved the construction of a 10-bed hospice on campus. We had discussed how such a facility could be connected to various research activities at UBC, in medicine and pharmacy of course, but also in theology, philosophy and psychology. I really hope this facility will live up to its expectations and address some of these issues. 1 Response to How come we never talk enough about death? Thanks Nassif. I was at the memorial service as well. It was a great service. The attendance truly spoke volume for the respect that Virginia earned and deserve. I, too, am very impressed by Virigina through the short time that I had met her. It truly is a loss for all of us for not having her wisdom and grace. It is a priviledge to have met her and worked with her even for such a short time.